Pure Pop Radio’s Springtime New Music Explosion, Day Two: Jump into the Poole! Day two of Pure Pop Radio’s Springtime New Music Explosion (and thank you for joining us, melodic popsters!) kicks off with the explosive new album from the Dowling Poole, this time comprising not only Willie Dowling and Jon Poole, but also Givvi Flynn. The Dowling Poole | One Hyde Park We’ve long been huge fans of Willie Dowling’s work with Jackdaw 4, which slid upon their disbanding into the Dowling Poole, which found Willie hooking up with Jon Poole from Cardiacs and the Wildhearts. The duo is now a trio, with third member status being bestowed on vocalist Givvi Flynn. One Hyde Park, the sterling follow-up to the Dowling Poole’s Bleak Strategies, is a clear winner and a virtual tour de force and, if that weren’t enough, it’s an album influenced by sounds from across the pop landscape that doesn’t actually sound like its influences. In other words, it sounds like the Dowling Poole, which is a very good thing. Three songs stand out especially amongst the dozen on offer. “Willing to Change,” about trying to adopt a positive outlook in the face of so much negativity, is a poppy number with wonderfully-realized moving parts from within which a lovely melody and charmingly rich background harmonies thrive. In the title song, an imagined scenario finds a real London address in the Knightsbridge section of London that caters to the extremely, positively well-to-do getting its comeuppance. Art-pop conventions make for a gripping musical experience. And in the scorching, upbeat, Poole-sung “Fight, Fight, Fight,” the always-endearing pop convention–“ba-ba-ba-ba-ba-ba-ba-ba”–is actually the prize one gets for fighting for what’s right. Genius. We’re playing the aforementioned three songs in rotation, plus three more: “Vox Pops,” which incorporates a very Partridge Family-sounding keyboard line and a very Brian May-sounding guitar solo; “Hope and Glory,” an upbeat pop song; and “Bring Back the Glow,” a smooth, rolling ’70s number. We welcome back the Dowling Poole and, without question, look forward to album number three, hopefully coming not that very long from now to a stereo system near you. The Sonic Executive Sessions | “Welcome to the Circus” It’s quite possible that this is the only song being written about today that needs no commentary whatsoever. Another just-about-perfect song from the great Christian Phillips, “Welcome to the Circus” is stocked full of Christian’s gorgeous trademark harmony stacks. Oh, and the melody is pretty spectacular. We look forward to the next album of wonders from the Sonic Executive Sessions. 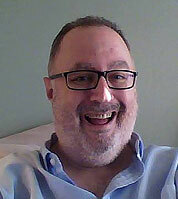 Until then, we have this golden nugget, which makes us, and you, about the luckiest people on the planet. Maxi Dunn | “Apple Blossom” and “Full Circle” Liverpool’s own Maxi Dunn will soon release her new album, Operation Bubble. We’ve added two songs that will appear there–the beautiful, majestic ballad “Apple Blossom,” and the upbeat, toe-tapping pop-rocker “Full Circle.” Operation Bubble promises to be a big winner. We can’t wait. Alice Bierhorst | The Beacon Produced with great care and compassion by the supremely talented Greta Gertler Gold and her husband Adam D. Gold, known collectively as the Universal Thump, The Beacon is the welcome arrival of a truly lovely album by a truly talented artist. Alice’s pretty songs and her tender, expressive vocals, which recall such titans as Laura Nyro, Joni Mitchell and Carole King, are wonderful constructs. Whether delivering a tender ballad (“Better Angels”) or an upbeat pop tune (“Airborne”), Alice is tops of the pops. Paperhearts | “Laurel Hill” and “A Girl Like That” Here’s a real treat: two songs from a band new to our ears. The pure popper “Laurel Hill” was recorded this past January and produced by Pure Pop Radio favorite Andy Bopp, whose new album we reviewed (read: raved about) and added songs from yesterday; the energetic “A Girl Like That,” with a hint of Byrdsian honey, was produced by the group’s bass player Jim Grice. Both songs were written by Mike Smith and will be featured on Paperhearts’ forthcoming album, Candygram. Something to look forward to, for sure. Thanks to Trax on Wax’s Gary Gebler for turning this group onto us. Deep Six | “No I Haven’t a Clue” and “Heading for a Fall” Another group new to our ears, Heavy Soul Records’ Deep Six is composed of musicians from ’80s mod bands the Threads, the Upper Fifth, and Makin’ Time. “No I Haven’t a Clue” is a pure pop stomper with a great melody and, as you might expect, a great hook. “Heading for a Fall” comes to us in demo form; it’s a catchy upbeat tune you might expect to hear around the campfire, if you’re so inclined. Great stuff, and a four-song EP will be on its way in June. The Carousels | “Lord Speed My Hurricane” and “Like a Loaded Gun” Look no further than the Byrds and like-minded artists for at least a few of the influences on this band whose home is the distillery town of Keith in northeast Scotland, where Chivas Regal whiskey hangs its bottles. Melody fans will savor these songs which constitute the two sides of a new single. Joyous. Gillian Nicola | “Oh Marie” From Hamilton, Ontario, Canada comes Gillian Nicola, a classically-trained vocalist whose “Oh Marie” is a taster track from her forthcoming EP, No Place to Call. The mid-tempo song is a melodic triumph; Gillian’s commanding vocal takes center stage with an affecting performance. We think you’ll be as enthralled with this song and performer as we are. Now playing in rotation. Loop Line | Wakes “Luke lives in Phoenix,” we find out by perusing Loop Line’s Bandcamp page.”Paul lives in Minneapolis. We make music together with the help of the Internet.” And with that information in our pocket, we play Loop Line’s music and we like what we hear. “Nothing About You” and “Parts Unknown” are terrific, upbeat pop songs with solid hooks, and what more could you realistically want? Samantha Tieger | “I’m in Love” Cincinnati, Ohio’s own Samantha Tieger turns in a catchy pop song with an affecting vocal and a really nice melody. This one would sound pretty good on the radio–hey, we can do something about that! We’re eager to hear more from this singer-songwriter who scribes musically in English, Spanish, and French. Now playing. Don Dixon and Dave Caruso | New Pure Pop Radio IDs Pure Pop Radio favorites Don and Dave work their vocal magic (separately) for our humble station, turning in new IDs that are sure to please. Magic? Indeed. Day two of Pure Pop Radio’s Springtime New Music Explosion is in the books. Time for day three of our festivities, kicking off tomorrow. See you then. While you wait, why not click on one of the listen links below and hear the above-mentioned new adds to our playlist and more than 8,500 other handpicked songs. Pure Pop Radio is taking care of your melodic pop needs! 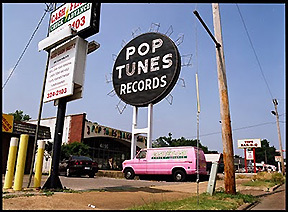 Pop Tunes, Show Three: The Playlist, Filled With Melodic Pop Goodness! Last night’s third edition of Pop Tunes, our new, weekly deejay show hosted by Alan Haber, contained more melodic pop goodness than you might imagine would be possible. But there it was, a host of catchy melodies that make up the soundtrack of your life! Dana Countryman | “Shari Girl, You’ll Always Be a Baby to Me” from Pop 3! Welcome to My Time Warp! That’s the rundown on last night’s third edition of Pop Tunes. If you missed the show, you can listen again this Thursday at noon ET (9 am PT) and on Sunday at 3 pm ET (noon PT). Thanks for tuning in! Pure Pop Radio: In Conversation’s special Drink a Toast to Innocence: A Tribute to Lite Rock Week ended this past Saturday, capping off six days of talks with Producer Andrew Curry and nine of the artists who contributed tracks to the project. All 10 interviews are now posted on the In Conversation PodOMatic podcast page, ready for you to listen to and download. If you already have Drink a Toast to Innocence, your enjoyment of this compilation will be suitably enhanced. If you’re new to the album, you’ll be moved to purchase it and enjoy it along with the rest of us. Thanks, as always, for listening to Pure Pop Radio: In Conversation! 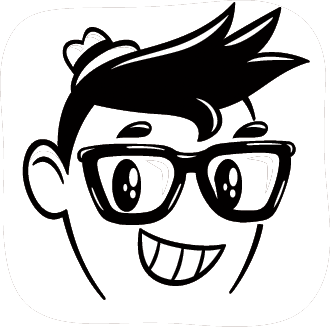 Visit the Pure Pop Radio: In Conversation PodOMatic Podcast Page! 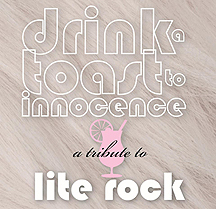 We shouted it from the rooftops throughout 2013, and now it’s come true: Drink a Toast to Innocence: A Tribute to Lite Rock has been showered with huzzahs from seven music critics, websites and a rockin’ National Public Radio affiliate down in sunny Florida. And we’re going to celebrate all next week on Pure Pop Radio: In Conversation with six days of in-depth interviews with the compilation’s executive producer, Andrew Curry, and nine of the artists who contributed tracks. All told, these interviews constitute the bible on one of the best various artist collections to be released last year or any other year. Beginning Monday, January 20, and ending on Saturday, January 25, Alan Haber will be talking to Andrew and the incredibly talented group of artists that contributed to Drink a Toast to Innocence. On Monday and Wednesday nights, and on Friday afternoon, Andrew steps up to the microphone and takes you from the idea’s inception to the compilation’s release. Everything you’ve wanted to know about this landmark record will be communicated during this hour and 45 minute-long chat that features tracks from the album. And then Tuesday, Thursday and Saturday, it’s the artists’ turn to talk about the tracks they tackled, taking you from choosing the songs to recording them and beyond. We’re writing the audio book on Drink a Toast to Innocence, dear music fans, and you can only hear it on Pure Pop Radio: In Conversation. Don’t miss this exciting event! Jot down the dates and times and immerse yourself in an unprecedented group of interviews with pop’s greatest artists and the man of the hour, Executive Producer and Lite-rock Impresario Andrew Curry!